Recorded in 2011, this brief disc of just five pieces is intended to be a tantalizing platter of musical hors d’oeuvres from one of history’s most musical families - the family Bach. Quite naturally, it is a piece from J.S. Bach - the Bach most familiar to us - that opens this disc. In this way we reacquaint ourselves with the musical palette of the father before we move onwards to the works of the sons. The opening Toccata is played very well, with a good sense of nuance, particularly where there were interwoven sequential melodies - just beautiful. That said, some of the exposed single line melodies could have been played a bit more gently. This is something that applies to the disc as a whole, but I believe this to be a matter of the instrument and its modification - which I shall address a little later - and not of the playing. I would have also liked some more legato in places, but I am aware this is just a matter of taste. If we were to get into the matter of historical performance, this would have been performed on a harpsichord, which, as a plucked instrument, didn’t have a legato action in its arsenal. However, given that the medium of performance is a piano, why not make tasteful use of its extra abilities? The works of the sons on this disc are wonderful pieces of music, and while it is very clear that they learnt their trade from their illustrious father, they all have their own musical styles whose genius has been unfairly overshadowed by that of their father. The works of two sons are presented here - Carl Philipp Emmanuel and Wilhelm Friedemann, both of whom were composing in the transition between the Baroque and Classical periods. This being the case, it is clear to see how these composers had their influence upon the development of the classical style. C.P.E. Bach’s Fantasia in F sharp Minor has an opening that is played delicately and with elegance, which I loved. However, the exposed melodies tended to be overly percussive - I heard just as much of the mechanism as I did of the music in places, which was slightly off-putting. That said, the contrasting moods are brought out very well indeed, between the delicate introduction and the louder, more grandiose bursts of music. Both musically and in terms of the playing, W.F. Bach’s Fantasia in E Minor is my favourite piece in this selection. The florid opening feels like an operatic overture, played with authority and clarity, and the faster sections of music are very engaging indeed. There’s a great range of moods, all of which are brought out well, especially at the junctions between moods. The intentionally quieter sections were particularly expressive here, and the vocally imitative lines are satisfyingly done - as a professional singer myself I soon found myself singing along to the melodies. They sat very nicely on the voice indeed. Another highlight was the recapitulation of the thematic material in C.P.E. 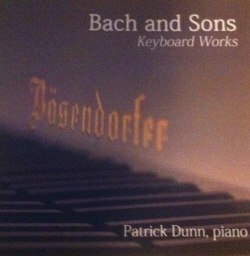 Bach’s Rondo in E Minor, the emotional and tastefully ornamented implementation of which grabbed my attention. The playing is very good throughout. Unfortunately, despite the expert level of playing and the wonderful music on display, something was not sitting quite right with me. After several listenings and reading the booklet and CD case - both of which are extremely brief - I found that the piano had been modified. I was not too keen on this in the first place, especially because the instrument used was a Bösendorfer Imperial Grand, one of the crowning glories of continental piano manufacturing. Supposedly, the piano has been altered to ‘enhance depth of tone, sustain and clarity’, but I remain unconvinced. It wasn’t broken so why try to fix it? Presumably as a result of the modifications, I found its action somewhat heavy, and the sonority overly rich in places. Such alterations might well be favourable for a lot of Romantic piano music, but it should not have had any place here. Another thing that irked me was the placement of the recording equipment. I felt it to be far too close to the piano. Rather than feeling as if I was attending a performance it was as if I'd just stuck my head into the body of the piano and asked Mr Dunn to play. This led to a lack of clarity at times, most notably in the louder sections. Given that this recording was made at “state-of-the-art facilities”, I would have expected better from the production team. All that said, these things are by no means fatal to what is a very good disc. The pieces were well chosen and the recital works as a superb introduction to the various sounds of the Bach family.